Delaware 14 travels east from Burrsville to Delaware 1 (Milford Bypass) through southern reaches of Kent County. Following Vernon Road east from the Maryland state line, the state route travels across agricultural areas and forest land 8.41 miles to the west limits of Harrington. Commerce Street angles SR 14 northeast to Clark Street through Downtown, while Farmington Road south to Harrington Raceway and U.S. 13 doubles as SR 14 Truck. Clark Street crosses paths with U.S. 13 at a split intersection with Dupont Highway by several traveler services and a shopping center. 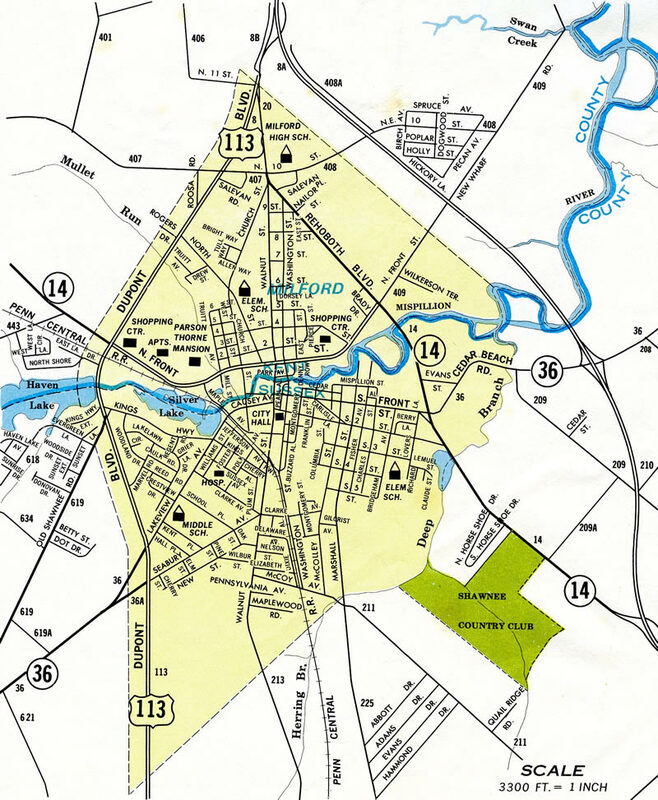 Delaware 14 (Milford Harrington Highway) continues east from Harrington through a mixture of farm land and large lot subdivisions to Marvels Crossroads and Church Hill Village. The route veers southward ahead of Delaware 15 on the approach to Milford city limits. Delaware 14 arcs across the Kent County side of Milford. Through Milford, Delaware 14 follows NW Front Street by an number of industrial businesses to the commercialized intersection with U.S. 113 (Dupont Boulevard). Beyond U.S. 113, Front Street curves by Silver Lake and narrows across the Milford street grid. Delaware 14 intersects Walnut Street north of Downtown and follows NE Front Street for the remainder of its route to Delaware 1 Business (Rehoboth Boulevard) and the Milford Bypass. 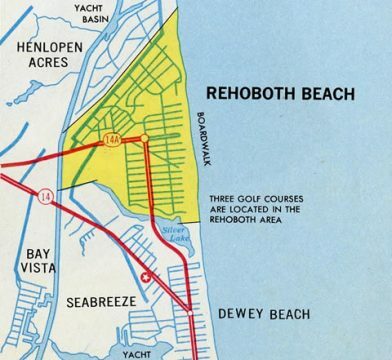 Delaware 14A looping through Rehoboth and Dewey Beaches - 1969 Official Delaware Highway Map. The 1936-37 Official Delaware Highway Map outlines Delaware 14 along the same alignment it takes today, from Burrsville east to Rehoboth Boulevard in Downtown Milford. The route extended south along Rehoboth Boulevard in Milford along the current alignment of Delaware 1 to Five Points, where it combined with Delaware 18 east to Wescoasts Road. Wescoasts Road turned the route back south to Lewes and Rehoboth Road to Midway. This alignment was later replaced with the dual Coastal Highway. Lewes and Rehoboth Road took Delaware 14 southeast to Rehoboth Beach, where the route followed Rehoboth Avenue east and 2nd Street south to Silver Lake and Dewey Beach. This later became Delaware 14A and is now Delaware 1A. The Coastal Highway bypass of Rehoboth Beach was constructed by 1942. Further south at Bethany Beach, Delaware 14 followed Pennsylvania Avenue to end at Delaware 26. The state route was extended south from Bethany Beach to Fenwick Island and the Maryland state line by 1942. The Bethany Beach bypass, a dual highway one block west of Pennsylvania Avenue, was completed by 1966. The north-south alignment of Delaware 14 was renumbered as Delaware 1 in April 1974. The change was made in anticipation of a long range plan to extend the route north to the Delaware Turnpike. Delaware 14 through Milford and the completed Milford Bypass. "Bypass Bids Asked." The News Journal (Wilmington, DE), March 27, 1970. "Milford road bypass to open Tuesday." The News Journal (Wilmington, DE), May 5, 1972.